Next week on Thursday, March 16, 2017 there will a special opportunity for the pro-life community in Alabama. We need your help! March 16 this year has been designated as “Pro-Life Day” by the Alabama House of Representatives. This is a special opportunity. Important pro-life legislation will be on the calendar. We will not have a rally outside as in earlier years. We need to have a presence inside the statehouse. To do that we need as many people as possible to be there that day. People need to call on their House member and sit in the gallery or overflow rooms to watch the debate. We need to show the House we respect their willingness to support pro-life legislation. This is one of the most important pro-life days for Alabamians this year. 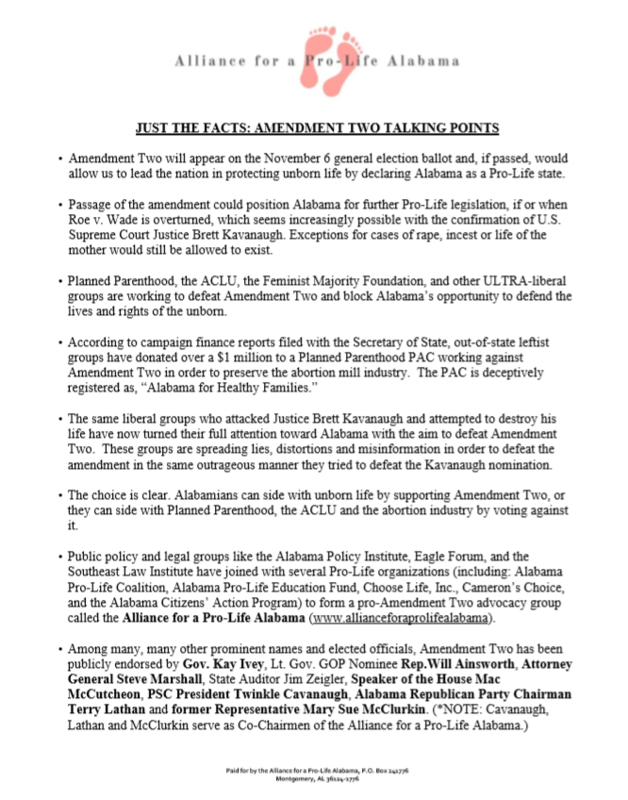 We need every Eagle Forum of Alabama member and pro-lifer to be present to ensure successful passage of important pro-life legislation this year. For more information on pro-life day this year, please contact us at (205) 879-7096. We are happy to help answer any questions about this important event. 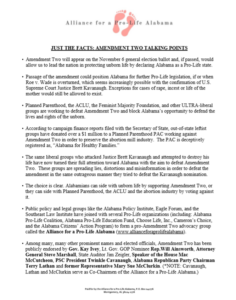 Eagle Forum of Alabama would like to see the successful passage of these bills this year. 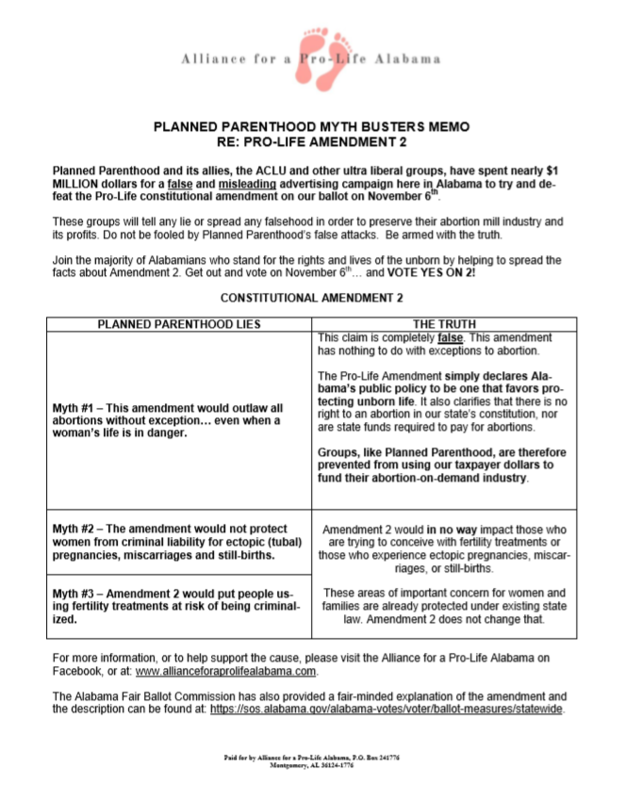 The first three bills with asterisks listed below are pro-life bills that have been promoted for years, but have not yet passed. We need your help to make sure all these pro-life bills pass this year. All that is needed is your presence. You standing up for the voiceless. Join the social media campaign for life on the Pro-Life Day next week. Use the hashtag #prolifeAL and the phrase “Defend All Life in All Stages” starting Thursday morning. Act now before the end of the session to ensure pro-life legislative victories! Your voice is needed to protect human life. All you have to do call or e-mail. Your legislators need to hear that you support the pro-legislation below. << HB376/SB363 (Butler, House and Willams [Senate]): The Alabama Unborn Child Protection from Dismemberment Abortion Act would, if enacted, end dismemberment abortions – This bill would stop this barbaric practice and protect babies from the harmful pain when this type takes place. <<SB205 (Sanford, Senate): Ban on Abortion Clinics 2,000 ft. away from a school. If enacted, this legislation would protect students from being targeted by abortion clinics. <<HB157 (Mooney, House): Ban on Assisted Suicide outlaws assisted suicide in Alabama. Currently, Alabama has no protection to protect individuals from this practice. <<HB158 (Wingo) Child Care Provider Inclusion Act protects adoption agencies from being closed by unfair government license requirements which violate the First Amendment. 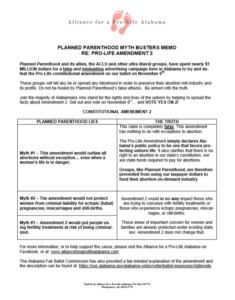 Please find your legislators and let them know of your support for these important pieces of legislation and your support of pro-life efforts. Remember to be polite but passionate in your request for their support. First step – Please call your Representative and Senator. Tell them you are their constituent and ask them if they are sponsoring any of the above bills. Thank them if they are a sponsor. 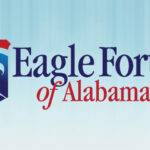 Go to Eagle Forum of Alabama’s website to find your legislators at http://alabamaeagle.org/find-your-legislators. Second step – Please call the leadership. Ask Senate and House leadership to support these pro-life measures. Senate Rules Committee Chairman, Jabo Waggoner: 334-242-7892 (Montgomery) (Thank Jabo for his support of Dismemberment Bill). 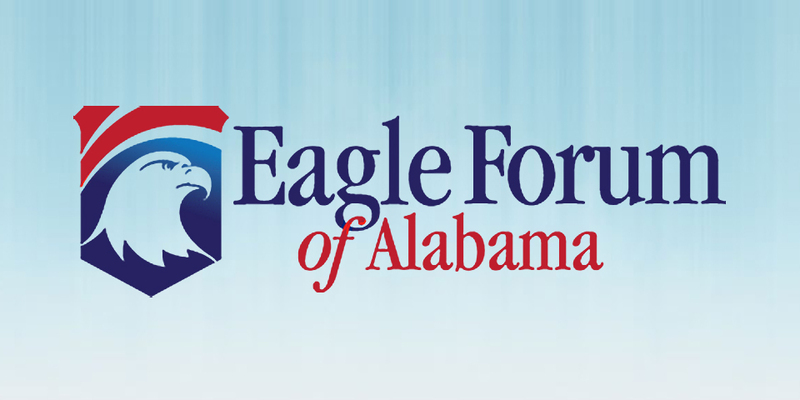 If you have further questions on pro-life legislation this session, please contact Eagle Forum of Alabama at (205) 879-7096.